On October 10, 1988, “Island” label released “Rattle and Hum”, the sixth U2 studio album. It was recorded 1987 – 1988, at “Sun Studio” in Memphis; “Point Depot”; “Danesmoat”, and “STS Studio” in Dublin; “A&M Studios” and “Ocean Way” in Los Angeles, and live in various locations, and was produced by Jimmy Iovine. The album was accompanied by a rockumentary film directed by Phil Joanou. 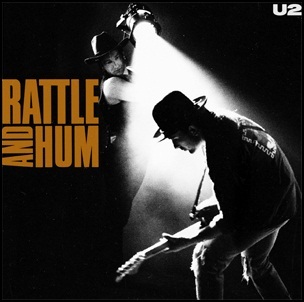 “Rattle and Hum” was certified 7 x Platinum in Canada by “Music Canada”; Platinum in Germany by “BVMI”; Platinum in Netherlands; 2 x Platinum in Switzerland by “IFPI Switzerland”; 4 x Platinum in UK by “BPI”, and 5 x Platinum in the US by “RIIA”. All lyrics by Bono; all music by Bono, The Edge, Adam Clayton and Larry Mullen Jr, except where noted.